The Expanded Panama Canal to Accept Mega Cruise Ships? The Panama Canal is an engineering marvel allowing cargo and cruise ships to cross Central America efficiently instead of skirting the southernmost part of South America at Cape Horn. For years, most cruise vessels could pass through the locks, but as they got increasingly bigger over time, they outgrew the canal. Now the canal is expanding with a third lane of larger locks and will be able to accept many larger cruise ships in the near future. Anyone who has taken a Panama Canal cruise knows just how fascinating it is to be on a ship of around 90,000 tons in size as it effectively rides an aquatic escalator up the continent, over a central lake and back down again on the other side. Clearances are often super snug, as ships’ steel hulls glide gracefully past concrete walls as close as inches away, guided by mule trains tied to the mooring lines. Just go down to a lower deck to see the locks immediately outside a window to really perceive the staggering scale. Panamax refers to ships of proper size that will fit through the existing locks, 1,050 by 110 feet in outer dimensions. And there are many classes of cruise ship that are designed to those transit specifications such as Celebrity Cruises’ Millennium-class, Princess Cruises’ Coral-class and Holland America Line’s Vista- and Signature-class. However, most ships built thereafter have exceeded the limits of the Panama Canal, especially Royal Caribbean International’s Oasis-class and its Allure of the Seas, currently the largest cruise ship in the world until it’s superseded by the Harmony of the Seas in 2016. 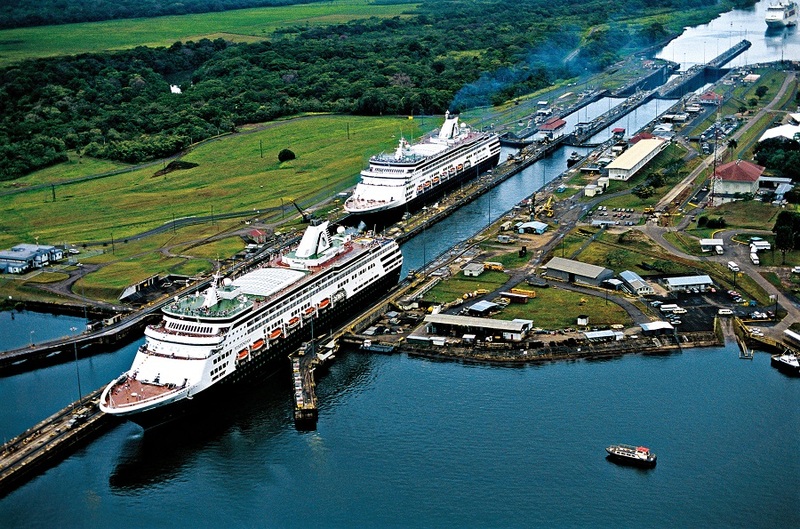 At a time when Nicaragua is exploring options for its own canal project, the Panama Canal is expanding to accommodate larger vessels, supertankers in particular, which account for far more traffic and income for the canal zone than occasional cruise ships do. Nonetheless, the expansion will positively affect the cruise industry, opening up greater itinerary opportunities for bigger ships. Of course, larger cruise ships can already overcome size restrictions with longer routes, as many have, but a direct cut through the Americas will greatly simplify future repositionings. So once completed, will the Harmony of the Seas be able to fit through? Well, not quite. The new lane of locks, under construction in parallel with the existing ones, will measure in at 1,400 by 180 feet with a 60-foot draft, but the maximum allowed ship size will be capped to 1,200 by 161 feet and a 50 foot draft. The Oasis class, which will include the slightly larger Harmony of the Seas, indeed fits within the lock dimensions. However, the ships’ 236-foot height above the water line will not clear the Bridge of the Americas, which spans the Pacific Ocean entrance of the canal with a height of 201 feet below. So unless the bridge, which was built in 1962, is either removed or replaced by a taller one, the Harmony of the Seas is out of luck. Next up in decreasing size is another Royal Caribbean International class of cruise ships, the 168,666-ton Quantum class consisting of the line’s newest Quantum of the Seas, Anthem of the Seas and Ovation of the Seas coming in April 2016. They would clear the edges, and while their exact height is not disclosed, considering their 18 decks at an average of 10 feet each, they would measure in at 180 feet overall off the waterline, which would clear the bridge. This is good, since these ships were designed as all-weather ones that would work well in Alaska, and as five are currently scheduled, they would be perfect for easily repositioning from the Caribbean to Alaska. But that formula for calculating the exact height of ships doesn’t always work, as Royal Caribbean International’s even smaller 18-deck-tall Freedom-class ships are 209 feet in height, putting them outside the bridge clearance. Even Cunard's Queen Mary 2, designed to clear the 228-foot height of the Verrazano-Narrows Bridge in New York won’t clear Panama’s span, unfortunately. With certainty, at least given what we know of their height and if the ships’ overhanging lifeboats don’t get in the way, it’s known that Norwegian Cruise Line’s Breakaway-class, the Norwegian Breakaway and Norwegian Getaway, up there with the largest ships in the world, would clear a full Panama Canal transit. 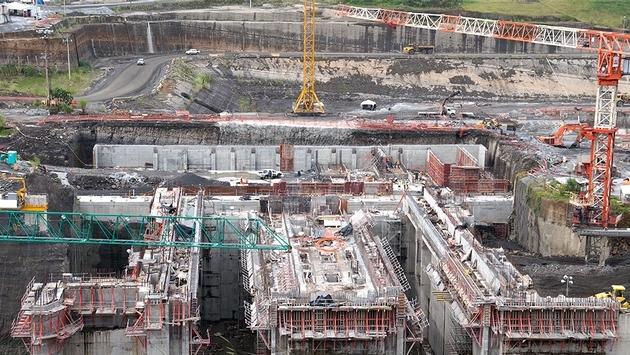 Actual passage through the expansion is, of course, subject to its completion, and the Panama Canal project has already been delayed. It was once scheduled for completion for the facility’s 100th anniversary on August 2014, but strikes and disputes pushed that date back to 2015 and now to April 1, 2016. Time will tell when the new Panama Canal officially opens, which cruise ships will be able to successfully pass through it and whether or not that pesky bridge clearance will ever be overcome.